GREAT NEWS FOR MALAYSIAN BLACKJACK!!!! As you know, YG Entertainment already announcement about the date of 2NE1 2014 WORLD TOUR: ALL OR NOTHING LIVE IN MALAYSIA. 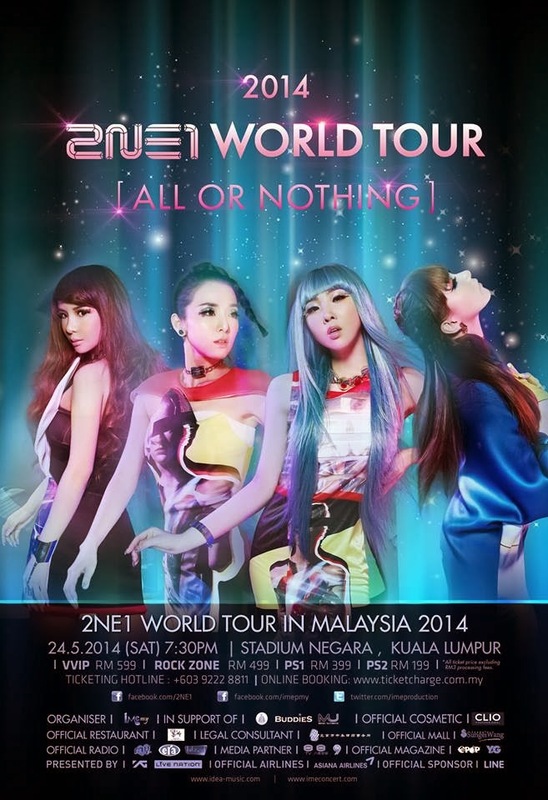 2NE1 will hold the concert of 2NE1 2014 WORLD TOUR: ALL OR NOTHING LIVE IN MALAYSIA on 23 May 2014 (Friday) (7:30 pm) at Stadium Negara, Kuala Lumpur. The organizer of this concert is IME Productions. On 4 March 2014, the organizer make announcement on their official facebook that the date of the concert are move from 23 May 2014 (Friday) to 24 May 2014 (Saturday). That really GREAT news to all BlackJack in Malaysia. IME Productions also make the announcement about the ticket launching information and seating plan of 2NE1 2014 WORLD TOUR: ALL OR NOTHING LIVE IN MALAYSIA. Ticket launch will be held on 9 March 2014 (Sunday) at Sungei Wang Plaza concourse area from 11:00 am until 3:00 pm. The first 500 purchaser comes will get the exclusive limited edition giant poster and the first 200 tickets comes will get the Clio make up product. Online sales will begin on 9 March 2014 (Sunday) at 3:00 pm via TicketCharge (www.ticketcharge.com.my) or call ticket hotlines (603) 9222 8811. The outlet sales will begin on 10 March 2014 (Monday), please visit TicketCharge office, Speedy music store, Rock Corner music store, Victoria music center, Neway Karaoke outlet and Celcom Blue Cube outlet. *Each person entitles to purchase 8 tickets only.